Milwaukee Bucks impressed with an easy 134-111 win over the Golden State Warriors in the “Oracle Arena”. 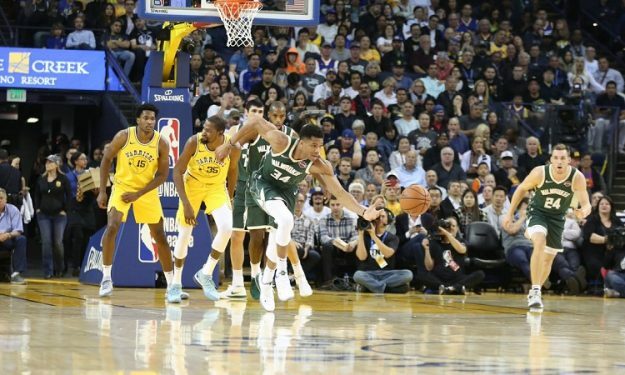 Giannis Antetokounmpo only needed 26 minutes to score 24 points for the Milwaukee Bucks in their 134-111 away win against the Golden State Warriors. The “Greek Freak” also grabbed nine rebounds, dished four assists and added two steals and two blocks! The Bucks already had a commanding lead when Stephen Curry left the match in the third quarter with a left adductor strain. Jusuf Nurkic had 16 points and nine rebounds in Portland Trail Blazers’ 116-105 win over the Los Angeles Clippers. Only Damian Lillard (25 pts.) and CJ McCollum (23 pts.) surpassed him in scoring. Danillo Gallinari sank 20 points for the Clips. Dennis Schroder finished up with 14 points, six rebounds and five assists in Oklahoma City Thunder’s 98-80 win against the Houston Rockets. Clint Capela scored 17 points for the losing side. In other action, Kyrie Irving scored a season-high 39 points in Boston Celtics’s overtime 116-109 win over the Phoenix Suns. Oklahoma City Thunder Houston Rockets 98-80 Dennis Schroder 14 pts., 6 reb., 5 ast., 1 stl, Alex Abrines 0 pts., 4 reb., 1 stl., Timothe Luwawu-Cabarrot 0 pts. – Clint Capela 17 pts., 7 reb., 3 ast., 1 stl., 1 blk., Isaiah Hartenstein 0 pts., 3 reb. Phoenix Suns Boston Celtics 109-116 (100-100) Elie Okobo 4 pts., 1 reb., 1 ast. – Guerschon Yabusele 0 pts., 2 reb., 1 ast. Portland Trail Blazers Los Angeles Clippers 116-105 Jusuf Nurkic 16 pts., 9 reb., 1 ast., 3 blk. – Danilo Gallinari 20 pts., 5 reb., Boban Marjanovic 4 pts., 4 reb., 1 ast., 2 blk., Milos Teodosic 0 pts., 1 reb. Golden State Warriors Milwaukee Bucks 111-134 Jonas Jerebko 0 pts., 4 reb. – Giannis Antetokounmpo 24 pts., 9 reb., 4 ast., 2 stl., 2 blk., Ersan Ilyasova 5 pts., 8 reb., 3 ast., 1 stl.